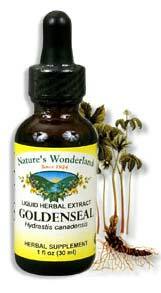 Golden Seal Root Extract, 1 fl oz / 30 ml (Nature's Wonderland) - Penn Herb Co. Ltd. AMOUNT PER SERVING (200mg/ml or 30 drops): Certified Organic Goldenseal Root (Hydrastis canadensis). OTHER INGREDIENTS: Grain Alcohol (60-70% by volume), Deionized Water. Free of: milk, dairy, egg, fish, shellfish, tree nuts, peanuts, wheat, gluten or soy. Soothes gastrointestinal distress; supports healthy liver & gallbladder function; supports healthy pancreas; promotes urinary tract health; throat, mouth & gum care (gargle/mouthwash). 20-40 drops in water or juice, 2-3 times daily, or as needed. DO NOT USE DURING PREGNANCY. NOTE: Herbalists generally do not recommend using Goldenseal for over 2 weeks in a row. Shake well before using.